Double record for the Italian-based world giant in the high-end nautical sector: Azimut-Benetti tops the Global Order Book 2014, published by the prestigious American magazine ShowBoats International, in terms of boats under construction and as builder of custom-designed megayachts. With as many as 79 megayachts under construction, Azimut-Benetti has, for the 14th time, topped the Global Order Book 2014 - the ranking of the top 20 international builders of superyachts - well ahead of its nearest competitor. The list compiled annually by Show Boats International, the prestigious U.S. trade magazine and the most reliable and authoritative point of reference for the boating industry, gives an accurate snapshot of the market, basing its data on actual orders. In addition to the large number of projects under construction, almost double those of the runner-up, the group's clear market leadership is given by the size of the yachts built: 122 feet on average, a sign of the group's great production capacity. This undisputed success is further confirmed by the ranking of the top 20 world builders of custom-designed megayachts, thanks to Benetti, the group's brand of megayachts, which ranked first in this category for the 15th time. The great work done in recent years in terms of developing new boats, continuously improving existing ones, strengthening the sales and support network, and focusing ever greater attention on our customers, continues to be greatly appreciated by boat owners across the globe, who regularly demonstrate their confidence in us. The procedure for Livorno’s production site work safety certification BS OHSAS18001:2007 has been finalised. 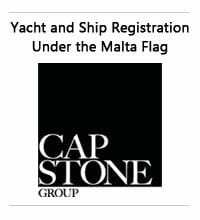 With a total amount of 11 certified locations Azimut Benetti Group is the only Group in the nautical sector to have gained a multi-site accreditation. 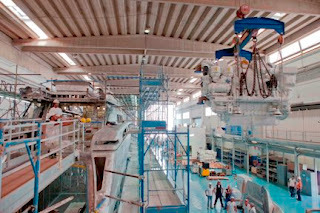 Started in Avigliana in October 2009, and ended in November 2013 in Livorno, the procedure for the ‘BS OHSAS 18001’ certification has involved eleven different sites, all belonging to Azimut Benetti Group. On December 2nd RINA Technical Committee for Safety authorized the new OHSAS 18001:2007 certificate release for Livorno’s site, thereby stating the implementation, along with the applicable laws, of an accurate control system regarding the workers’ Health and Security. Bush & Noble is the new distributor for Bavaria in Dubai and will now on look after customers in the United Arab Emirates (UAE), Bahrain, Qatar, Kuwait and Oman. With this step, Bavaria strengthens its efforts in the Persian Gulf region. The team at Bush & Noble are proud to be able to offer products “Made in Germany”. Only two years ago, this new company was founded by John Bush and Brett Noble in Dubai, together both yacht brokers and consultants have more than 23 years of experience in the water sport industry. The company philosophy is to focus on high quality customer service for its yacht owners and this has been the key to the success of the Bush & Noble team over recent years. Beside the offices in Dubai and Bahrain, Bush & Noble have a far-reaching network of service partners, which from now on all Bavaria customers can benefit from. Future Bavaria customers will find the famous sailing and motor yachts from Germany now at all exhibitions in the Persian area. Leading luxury motor yacht manufacturer, Fairline Boats, is celebrating a major milestone with the launch of its 100th Squadron 78. The original Squadron 78 was first unveiled to the world in 2003 at a prestigious event near the Tower of London. Since then, it has gone from strength to strength, becoming one of Fairline’s most successful and iconic luxury motor yachts with a very loyal following. The 100th build of the Squadron 78 follows the recent launch of its most customised model ever, a Squadron 78 CUSTOM called MATCH 2. This was one of the Fairline Yacht Division’s most exciting and challenging build projects to-date with almost 400 custom items. MATCH 2 was the owner’s fifth Fairline and his second Squadron 78. Top statistics about the Squadron 78: the total value of all the Squadron 78s sold to date is over £150million, if you laid all the 100 Squadron 78s out in a line they would be the equivalent of 1.5 miles in length – that’s 1.5 miles of refined luxury motor yacht, a total of 1,942,200 man hours to build all 100 Squadron 78s, over 10,000 customisations have been undertaken across all 100 Squadron 78s making it the most bespoke and customised Fairline boat ever, over 160,000 man hours to undertake those customizations, 7,300 square metres of teak used 10,600 square metres of luxury carpet, and 558 tonnes of Coremat fibreglass with 1,200 tonnes of resin. As the 2014 model year begins, we have major news to deliver said Hunt Yachts’ President Peter Van Lancker. Scout is a partnership between David Howe and Peterson Capital LLC, which was created specifically to work closely with U.S.-based companies that show significant potential for long-term success. Peterson Capital LLC is operated by an icon of American business, Pete Peterson. Peterson’s career spans several decades and includes positions as United States Secretary of Commerce, CEO of Bell and Howell, and co-founder of The Blackstone Group. David Howe has a great personal passion for the marine industry. Having grown up sailing out of Marblehead, Massachusetts, Howe deeply appreciates the strong heritage of Hunt. Scout purchased The Hinckley Company at the end of 2010. The most immediate synergy is in the Hinckley service yards which now have a direct pipeline to Hunt parts and technical advice to service Hunt products. Hunt will operate under the name Hunt Yachts, LLC and will maintain the same relationship it has had with C. Raymond Hunt Associates as the exclusive designer of its product line. The Hunt Yachts Chesapeake sales office is located at the Hinckley service yard at the old Crockett Brothers boast yard at 202 Banks St., Oxford, MD 21654. 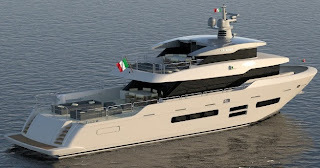 ISA Yachts is worldwide known as a major Italian builder of custom and semi-custom motor yachts. But the same competence, service and craftsmanship characterize the yard's After Sales and Refit department which benefits from the excellent facility that allow hosting a large number of yachts both ashore or afloat. The premises include a deep water marina; named Ank's Marina with 10 berths all alongside and a large hard standing area where the yachts can do any kind of refit or maintenance work also under a temporary cover or inside a shed. This winter, as it happened in the past years, ISA Yachts will host several of the yachts delivered in the recent past that come back home for maintenance and assistance. At the moment, there are four yachts delivered by ISA Yachts between 2007 and 2012 that decided to come back to the shipyard located in Ancona, on the Adriatic coast of Italy, to carry out some maintenance works. They are: M/Y Gemini, an ISA 120' delivered in 2007, M/Y Alexandar V, an ISA 48 meters built in 2008, M/Y Mary-Jean II, an ISA 60 meters delivered in 2010, and M/Y Belle Anna, the latest ISA 50 meter launched last year. Since her delivery M/Y Alexandar V came back to ISAYACHTS every winter and so did M/Y Mary-Jean II. This has nothing to do with the warranty period which has already expired but it is related to the high standards and reliability of the After Sales service offered by ISA YAchts to its customers. 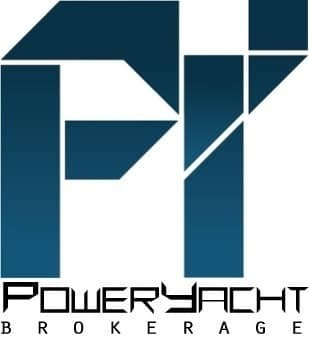 A dedicated team of professionals is able to carry out major refits and maintenance projects employing the same qualified workers and contractors that originally built the yachts in order to grant a complete satisfaction to their owners and captains, with haulage and launching technologically-advanced equipment. This dramatically cuts the time needed to complete every intervention with a consequent reduction of cost, and it guarantees that the work will feature the same high level of quality as the rest of the yacht. In other words, building a yacht at ISA Yachts gives Owners an extra benefit: the possibility to count on an After Sales service that is able also to accommodate their yachts during the winter period for long maintenance sessions or just for a short “pit stop” between two charter seasons. Moonen Shipyards in the Netherlands has a new majority shareholder who has committed to invest in the long-term future of this leading superyacht builder. The takeover was completed in October and ensures long-term financial security both for the yard and for clients of new and existing build and refit projects. The new shareholder of Moonen Shipyards has a decade of first-hand experience of the excellence of the motor yachts built by Moonen. Earlier this year he took possession of the fully custom 42-metre Sofia. As well as being the largest project completed to date by the yard, this cross between an expedition vessel and classic modern yacht has been making global headlines for her three-seat submarine and exceptional interior design. Sofia was the third Moonen owned by the new shareholder who first purchased the brand-new Moonen 84 Sofia (now Eleonora) in 2004. Delighted with this vessel, he then commissioned a new Moonen 97 to meet his personal requirements, which was duly launched in 2008. Riviera owners in Sydney enjoyed every facet of the Riviera lifestyle as they celebrated Riviera’s Bling on Summer Christmas Party at one of Sydney’s boating jewels, The Basin, located on the western foreshore of Pittwater. Riviera 33 Open Flybridge owner Martin Shaw joined the convoy travelling from Sydney Harbour to The Basin on Friday, November 29. A high wind warning of 20 to 30 knots and three metre swell would normally deter Martin from venturing outside the Harbour, but with the R Marine Sydney team on board a 445 SUV and other Riviera owners travelling in the fleet, Martin felt confident in his ability to navigate the conditions. Martin’s partner Annette Tomlinson and their friend Susan O’Hare joined him on board for the weekend. The weekend began with a visit from Santa who delivered special Riv gifts to each boat on Friday afternoon and then on the Saturday it was time for the ‘French Riviera’ themed activities with a Boules competition, Baguettes and chilled Beaujolais on the lawn. At 3.30pm, the fleet of 25 boats travelled line astern to the Royal Motor Yacht Club Newport for the Christmas Party. Beginning with ‘Champagne on the Dock’ at 6pm before a fleet of stretched limousines escorted the 100 guests to the Yacht Club to celebrate in true Riviera style. A selection of fine wine, food and entertainment was enjoyed by all as they celebrated Riviera’s Bling on Summer Christmas Party. Riviera 40 Open Flybridge owner Greg Fullerton and his wife, Tracy, travelled ahead of the convoy from Sydney to The Basin in conditions, which Greg described as ‘moderately challenging’. Both Martin and Greg look forward to spending time aboard over Christmas and the New Year. Martin and Annette will spend Christmas on board and plan to travel as far north as they can manage, possibly to Port Stephens. Greg’s philosophy is ‘if the sun is up, the propellers ought to be turning’, so Greg and Tracy plan to spend many summer days aboard, including their annual Boxing Day voyage to watch the Sydney to Hobart race start. Global Order Book 2014 publishes the new ranking of top builders over 24 meters with Sanlorenzo climbing to the second position in the world ranking of top builders of over 24-meter yachts and confirms its growing trend, in total contrast to the global nautical market. Since 1992 the famed American magazine Showboats International has been publishing the annual ranking of top international builders of superyachts – both motor and sailing yachts over 80ft (24 meters) which is known as the Global Order Book. This ranking collects the order portfolio of each shipyard, taking into consideration yachts under construction and the sum total length of all yachts. The Global Order Book represents a clear picture of the global nautical market and, when published, it is reported in the main business and financial magazines worldwide for a pragmatic analysis of the sector. As reported in the latest issue Global Order Book 2014, that was recently published in the USA, Sanlorenzo climbed from third position up to second, with 39 projects under construction with a total length of 1,345 meters (4,413 ft), overtaking the Ferretti Group which is made up of 8 brands; that has an order book of 32 units. Sanlorenzo was awarded by the Italy-China Foundation (Fondazione Italia–Cina) as one of the Italian companies that better valued the business opportunities of the emerging Chinese market. Sanlorenzo was awarded for the investments made in the emerging Chinese market during the last few years, through its sales network expansion strategy in the Far East, the improvement and the strengthening of local business agreements and through the direct presence in China. This led Sanlorenzo to achieve positive results such as the delivery of a 38-meter Sanlorenzo SD122 motoryacht, an upcoming delivery of a 46-meter superyacht in steel and the recent opening of a direct office in Hong Kong, Sanlorenzo China Holding Limited, with the aim to distribute the Italian-built Sanlorenzo motoryachts from 22 to 62 meters to the Great China market (China, Hong Kong, Macau, Taiwan). 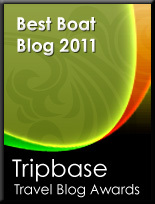 Sunreef has considerably strengthened its leading position as the luxury catamaran builder in 2013. Intense and challenging for all the Sunreef team, the 2013 turned out to be the best year in the 11 years of the shipyard’s history. With 11 launched yachts including 2 sailing catamaran premières - Sunreef 80 Carbon Line and Sunreef 60 LOFT, 3 superyacht project presentations, 6 catamarans now under construction and 2 new sales offices in Shanghai, China and Dubai, UAE; the shipyard demonstrated a successful global expansion strategy despite the general slow-down after the 2008 crisis. In 2013 the company has launched 6 power catamarans, including three 60 Sunreef Power and three 70 Sunreef Power. On the sailing catamarans side, the shipyard launched 5 units including two premieres. In 2013 the company has launched 6 power catamarans, including three 60 Sunreef Power and three 70 Sunreef Power. On the sailing catamarans side, the shipyard launched 5 units including two premieres. In a twofold plan, Atlantic Marine Electronics has moved next door from the Viking Yachting Center to the Viking Yacht Company facility. This move allows the Yachting Center to begin an exciting expansion plan while bringing AME closer to the production line and providing a new, larger work space for our favorite electronics outfit. The team is thrilled to be closer to the action and working under the same roof as the Viking Yacht Company. Being a subsidiary of the Viking Yacht Company allows AME access to the boat building process at inception. The boat then moves down the line with all companies monitoring the progress of not just the manufacturing of the boat, but the installation of the electronics to come. The AME crew has established themselves as the premiere electronics company within the marine industry. 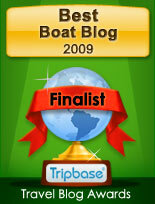 In just over 10 years, they have become the top choice for boat builders, owners and dealers worldwide. Through the tournament circuit and by word-of-mouth, yacht owners have seen AME's work and want the same attention to detail and perfection applied to their next boat or to refitting their existing vessel. Whether you are looking to outfit a new boat or add to your current vessel, AME has the expertise, product knowledge and field support to provide you with the best in the industry. Zeelander Yachts is proud to welcome Adriana Lima on board after the Brazilian beauty splashed out on a new Zeelander Z44. After shopping at the recent Fort Lauderdale International Boat Show, the Victoria Secret Angel was in the mood to treat herself and took the plunge by buying her latest accessory, the brand new 44-foot yacht. Adriana could not resist the charms of the beautiful and classic-looking Z44 after stepping aboard during the show, the deal was sealed after a meeting with Zeelander Yachts owner Sietse Koopmans and President John Slate. First tempted by the sight of the elegant Z44 when she admired the yacht near her Miami Beach mansion a few weeks previously, Adriana was already keen for herself and her family to enjoy a Zeelander of their own. After reaching the agreement at the boat show, Adriana celebrated later that evening by attending the exclusive Zeelander Owners Dinner, where she dined with other Zeelander owners and business partners of Zeelander Yachts. We congratulate Adriana on the purchase of the stunning new yacht and warmly welcome her into the Zeelander family. VIP guests heading to the prestigious Boat International Showboats Party arrived in fine style, thanks to Zeelander’s exclusive tender service. In honor of the 54th Fort Lauderdale International Boat Show, Zeelander sponsored the luxury gathering at one of Fort Lauderdale’s most impressive mansions in the Harbor Beach area as super yacht owners and industry high-fliers celebrated the launch of the latest edition of The Megayachts Book. Zeelander made sure everyone was in the party spirit as they transported them to a different world by offering the VIPs a complementary ride on the Z44 from and to their hotels and residences. Riva presents its new World wide web virtual showroom. An iconic brand since the early part of the twentieth century Riva started operating in 1842. But it was a sudden storm which in reality started the brand when Pietro Riva at the time a young ship builder moved to Sarnico to repair boats after this hit the area. This eventually gave Pietro the trust of the locals and his relocation from Como to Sarnico, and the start of the Riva brand. The son of Pietro, Ernesto continued where his father left, and with an innovative spirit also started building cargo and passenger ships with an internal combustion engine. After World War One, Serafino the son of Ernesto takes the helm of the company and gives Riva the final twist when he moves production away from commercial and started building leisure powerboats. At the time 1920 and thirties, Riva also competed with its boats collecting a large numbers of victories and records to its name. Just after World War Two in 1950 Carlo Riva, a man driven by great passion since his childhood for the sea and fast performing boats takes the helm of the company. It was a time of renaissance for Europe and Italy and Carlo created the status symbol wooden sport boat first with the Ariston, followed by the Tritone the first two engines of the series, Sebino which had a full production run, Florida which evoked the famous North American East Coast boating area, to arrive to the still status symbol Aquarama launched in 1962 and produced till 1996 and delivered in 784 hulls. In 1956 Riva also started collaboration with designer Giorgio Barilani who then becomes exclusive and later on design manager from 1970 till 1996 of the company. In 1969 another important step happened at Riva when it started it first fiberglass produced models with the 20 Bahia Mar and 25 Sport Fisherman both models licensed from the famous Bertram but modified with the Riva element of design and finishing. Other iconic models will follow in the seventies; from the small Rudy of 5.87 meters which is as at today best fiberglass seller with 364 units sold, to the St. Tropez a fast open sport cruiser of nine meters second of the best sold glass builds with 317 units, and the Superamerica which started as a 42 model and evolved over time to a 45, 48, 50, 50 Special, and 50 High Performance. 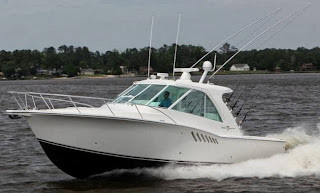 A total of 251 Superamerica's will be built from 1973 to 1993 making it the third best sold fiberglass Riva. Another unique model was the Riva 2000 designed by Italian sixties and seventies performance hull guru Renato Sonny Levi launched in 1975 and built till 1982 and sold in 54 units. Riva had also a couple ownership change with US fiberglass producer giant Whiitakar taking helm in 1969, Vickers in 1988, and Ferretti Group in 2000 which still as at today owns the brand. Another important step happens at Riva in 1991 when Mauro Micheli starts to design the boats with his first being the 58 Bahamas presenting the evolving new route. Micheli has since then designed all the Rivas. Currently Riva builds twelve models which start with the 27 feet Iseo, and the currently in construction alloy build 122 Mythos. Riva new web site is available in English, Italian, and Chinese language and takes you around with the following buttons; Riva, Models, Pre-Owned, News and Events, Dealer and Service Network, and My Riva. Riva also features its social media hubs; Facebook, YouTube, Pinterest, Tweeter, and Linkedin with a link and the bottom right of the page. In spring of 2014 the first all aluminium fast displacement motor yacht was launched at Heesen’s facility in Oss and christened Galactica Star. The concept was presented to the yachting community in September 2010 at the Monaco Yacht Club and the contract for the construction of the first 65 metre Fast Displacement Hull Form was signed just one month later. Construction took place at the Heesen facility in Oss where the laying of the keel was marked with an official ceremony in February 2011. Sophisticated hydrodynamic design by Van Oossanen Naval Architects resulted in a vessel that is 30% more e efficient than a round-bilge motor yacht. In conjunction with Heesen Yachts in-house naval architects, Van Oossanen Naval Architects also implemented the architecture. The vessel’s advanced design combines a special hybrid hull form that results in a very low wave profile over the entire speed range, while also improving sea-keeping and manoeuvrability. This provides a very positive impact on the cost of running the yacht, as well as lowering the environmental footprint due to reduced engine emissions. When combined with Heesen’s acknowledged weight reduction expertise and a pair of MTU 5766hp, the 65 meter Fast Displacement Hull Form will be able to deliver a top speed of 27 knots as well as a very economical fuel burn and a particularly long range of 4.200Nm at 14 knots. Award-winning designers have been appointed by the Owners for this very special project: Frank Laupman at Omega Architects is responsible for the streamlined and elegant exterior lines, while Bannenberg and Rowell Design have created the sophisticated interior that perfectly complements such a dynamic and sleek exterior design. 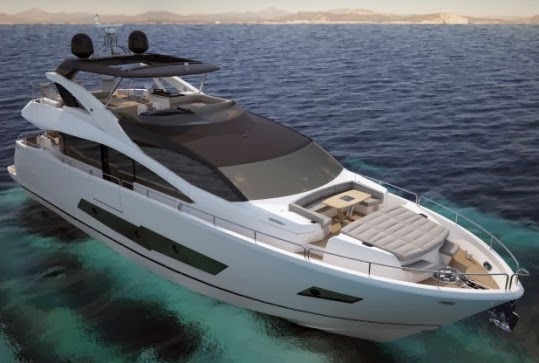 Sunseeker presents the project for a new 86 Yacht model which should replace the 88. As the rendering shows the 86 Yacht follows exterior styling cues of the very much praised 28 Metre larger model introduced in 2012. That means that a predominant feature of the 86 is that of a large window areas in both the main and lower decks. The 86 also features a nice integrated hard top which covers over half of the area of the flybridge. 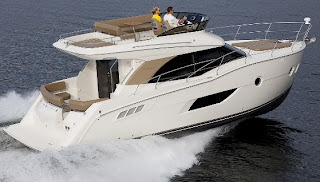 Four large cabins accommodate the owner and guests in the 86 Yacht. Interesting the owners stateroom of the 86 Yacht while still located amidships is in between the VIP to fore and the two guest cabins looking aft. The VIP suite located to fore also features a separate staircase. A nice feature is also the bar area on the central located galley on the main deck. Two crew cabins with a small lobby and galley are located to stern. 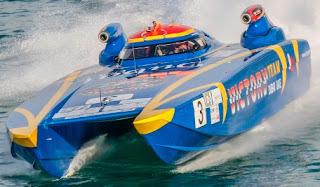 Power is twin engines which total 3850hp and should give max speed up to 30 knots. It's always hard for a builder to replace a successful model, and this surely was the case for Princess when it decided to move on from its decade produced, four hundred plus units sold of the 42. 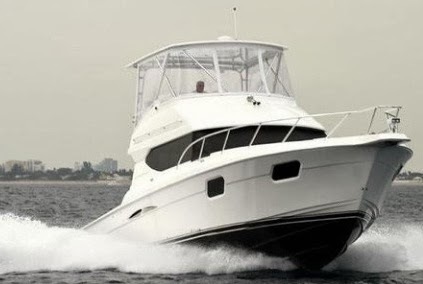 The Princess 43 replaces a long standing popular model, but more then replacing, this novelty evolves it with a list of important practical features. While many might think otherwise the Princess 43 is a new hull, longer by three feet, and beam extended by eleven centimeters. For this new 43 Princess worked a lot to improve the convivial areas, the flybridge for example a weak spot of the 42 now features a superb practical layout with more living space and a dinette which works, and the aft deck one of the most respected features of the replacement has also been increased in space and now includes two way transom doors as the larger Princess models. Inside the theme of more improvements continues, the main deck saloon is for example a view delight with its large all around windows making inside and outside blend in easy, and the galley located below also has a better connection to the saloon. Below both of the cabins also feature more headroom and an increase in space. If you want to be hard to get and find a weak spot to the Princess 43, I would say that considering it's length of fourteen meters that would be the no third cabin optional choice. Introduced in February 2013, the Marlow 62E Explore continues the new series line from this US brand Asian build yachts. The 62 E replaces the 61 introduced in 2004 with an innovation and more space being the key in the change of this new model. One short example of larger is that the 62E features one foot more beam then the 61 increasing space in every area of the yacht, both interior and exterior. The 62 Explorer also features additional fuel storage which equals more range, and less draft thanks to a reduced shaft angle which also improves speed and fuel economy. Marlow says these shaft angle changes coupled with the less weight of patented Full Stack Infusion build, reduce fuel burn at cruise by 10% plus an extra 5% of top speed. Interior wise the Marlow 62E Explorer offers a layout with three double cabins with a full beam amidships owners stateroom with shower heads looking to aft. A VIP cabin is to fore and this can be made to include two additional bunk berths. A third guest cabin is located to starboard. This cabin can be made as an office or a washing room. The main deck is a split level style with a large welcoming saloon. The raised part features a galley, an L-shaped dinette to port, and a central helm station. A crew cabin is located to aft which sleep three persons, and features a compact shower head. Post Yachts presents its new web showroom. Founded in 1957 by Russel Post, who previously to this formed Egg Harbor at the age of 16. The first Post model was a 34 Sportfisherman. In 1975 Post was sold to Charlie Walters, and Bill Schell. A note here is that at the age of seventeen Charlie Walters was Post Yachts second employee, who was with the company since its founding in 1957. In the past December Post Marine Group LLC purchased all assets of Post Marine Co. Inc and moved the building facilities from New Jersey to Maryland. Post currently offers a range of eight sportfisher cruisers and yachts from 42 to 66 feet. Three of the models; 42 Open, 53 Open, and 66 are in project stage and show the new direction of the today Maryland located builder. Post new web site takes you around with the following buttons; Home, Repair and Refit, News and Events, Current Models, About Us, and Contact. Its an interesting time for Chris-Craft which seem to have gathered a huge following with its latest quality looking models of sports boats and cruiser. Now the long standing US builder presents a project based on its currently produced largest 36 feet hull. The 36 Launch adds to the Corsair, European Edition, and the recently released Hard Top. Unlike the latest 36 Corsair Hard Top the Launch goes opposite direction and is a mostly day use dedicated cruiser. The 36 Launch features an exterior to enjoy from bow to stern with an easy walk around passage-way, and a clever layout featuring interesting design choices; from a very nice C-shaped dinette to aft, settee on the bow tip, large fore deck sun-pad, and the nice and large wet bar behind the three seats center console. But do not be mistaken by the all space outside as the interior of the 36 Launch still offers sleeping accommodation for five inside; large double berth to fore, and three berths amidships which are joined by a spacious shower head. Canados presents the new Oceanic range of explorer looking super yachts. The Oceanic range is a total new experience for the Italian Rome located builder, and Canados decided to go for the innovative route. Oceanic range will feature a new Displaning hull along with a DiElect mode. Canados Oceanic will feature four models; 90, 120, 140, and 160 with each of these available in two versions. The Oceanic 90 presented here is offered in the STS or Support versions. Her layout plan will offer four guest cabins, plus two crew cabins amidships. A first for a yacht this size is the owners stateroom located on the upper deck. Tender space will be of a high humber with space for one big Private Water Craft of seven meters in length. Power will be twin Cats 1925hp engines with max speed of 28 knots and a cruise of 24. A pod version will also be available thus decreasing speed by one knot, along with a diesel-electrical configuration resulting in long range silent running at eight knots. It's been an interesting development curve at Absolute and what it did in between the fifty to sixty feet in it's flybridge range. Just a reminder Absolute debuted in this category with a 50 Fly back in 2010, a model which was developed in a 53, 55 and now a 56. Unlike the other models the Absolute 52 Fly is a new hull with a slimmer beam to the models mentioned above. The new Absolute 52 Fly captures itself for its perfect layout of space; nice flybridge plan up top, aft deck with sun-pad, astern galley, and three large cabins below including a full beam owners cabin. Other interesting features is the very open feel of the saloon thanks to the large view windows, an Absolute feature since a few years now. Power for the 52 Fly is twin Volvo 435hp engines and IPS pods, nowadays propelling all the Absolute line which is a record in its own right. Absolute is estimating light load top speeds of 32 knots, with a 26 cruise. 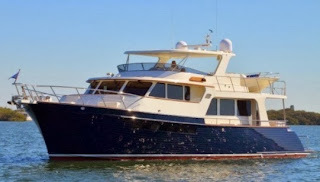 Jarrett Bay starts its sixty-one custom build with a 46 Walk-Around Express. This new fully custom construction Jarrett Bay 46 Walk-Around Express will be as the title says of a walk around layout, with full deck utility and an easy passage way from stern to bow. The exterior plan will feature a center located center console with a twin settee helmsman plus passenger, this resting to port side. To fore of the helm station will be an L-shaped settee, and aft is the must have mezzanine. No interior plans are shown so far. Power will be twin 1015hp Cat engines. 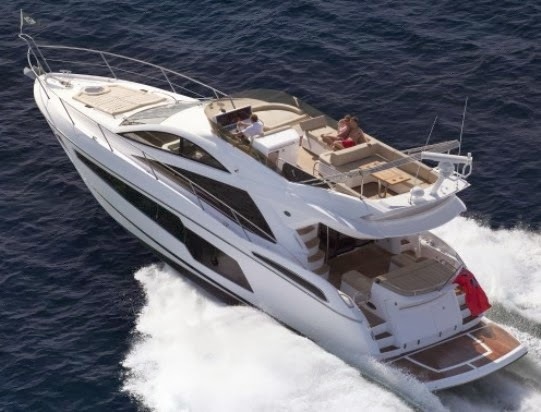 A note shows how performance requirements have increased over time for Sportfish Cruiser and Yachts, with this new 46 having a total of 800 more horses then to a 1999 Jarrett Bay 46 Express Hull#32. 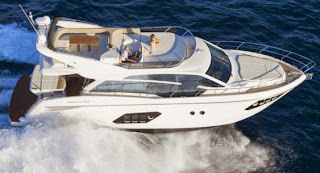 Its the largest model currently produced by Aquador and this is the finally launched 35 Cabin. An awaited model from the Finnish, Brunswick owned company. The Aquador 35 Cabin is a fully enclosed sport cruiser designed by Northern people for those living up top, and with an intended use all year round being it rain or sun. Thanks to an opening helms door to starboard side, the Aquador 35 Cabin also proves easy for single handling. As in standard Scandinavian design the starboard passageway of the 35 Cabin is also wider to that of the port side. Below the 35 Cabin offers two double cabins, with the owners room to fore, and a double amidships. A C-shaped dinette transforms to an extra double berth on the main deck, with opposite to this having the galley in a convivial area. The World famous Power Yacht builder Pershing presents a new World wide web showroom. The Pershing story starts in 1981 when a partnership between Tili Antonelli, Fausto Fillipetti, Giulano Onori created Cantieri dell Adriatico and the first model, a 30 feet wooden built sport cruiser. In 1985 the first Pershing was created and this was the 45 model designed by Fulvio De Simoni which in its sleek sport lines offered three double cabins. Since then Fulvio De Simoni continued never stopping the Pershing collaboration designing all its models, and creating another breakthrough in 1991 when the company presented its at the time flagship the 70 which featured an integrated curved windshield design. This feature will be one of the most copied design stints in the nineties. The 70 also reinvented the hard top design, which Pershing developed further in the 54, and 60 models later on. The Pershing 70 hull one prototype also featured an innovative jet turbine propulsion. In 1998 in a move to increase its growing global status Pershing joined the Ferretti Group. Later on to this comes a move to its current establishment now located in Mondolfo, a plant designed by Sandro Santini and having a total space of 55,000 square meters of which 38,000 are covered. 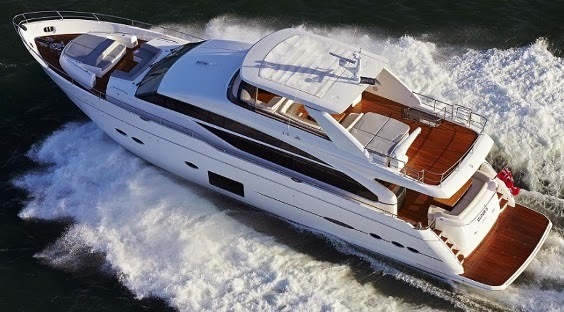 Pershing current line up features eight models which start with the 50.1, and end in the 2004 launched 115 flagship. Pershing latest model is the 62 a further evolution of the best selling 56 and 58 models presented World wide at the 2013 Cannes show. Pershing new web site is available in English, Italian, and Chinese language and takes you around with the following buttons; Models, History, News and Events, Dealer and Service Network, Pre-Owned, and Contacts. As is a must nowadays Pershing also features its Social pages; Facebook, Twitter, Linkedin, and Pinterest with link buttons on the top right of the page. Swedish motorboat brand Delta Powerboats puts into the water its most ambitious build to date, a 26 meter carbon fiber super yacht. Interestingly it took the Swedish company Delta Powerboats just ten years to grow from a 25 footer to the new 26 meter flagship. Delta has been working two years in producing from design to reality its 26 m Yacht flagship, which increases its size by about thirty feet from its previous largest model the 54 IPS. Designer Lars Modin worked high on his creative side, and just as the exterior the Delta 26 m Yacht features an interesting and innovative internal layout. Guest accommodation accounts to four large double cabins, with a very spacious full beam owners stateroom featuring a small dinette, walk-in wardrobe, and private en-suite head. The crew cabin located to midships sleeps two and also features a small dinette and galley. Main tender stowage is in a garage to aft which is located on top of the engine room, but a space for two more small private water crafts also exists on the bathing platform and the flybridge. Delta advised that during the first sea trial from Estonia to Stockholm, Sweden the 26 m Yacht reached top speeds at 37 knots. The Swedish company also says that the fuel consumption was around 40% less than to that of most competitor boats in this size. An interesting argument which with the elements we have; less weight which compares to that of yachts about ten feet smaller, and a less engine power needed to reach such speeds sounds good. Sometimes one can say a lot from what a boat model wants to represent by a builder from its name. With the 60 Shamrock, Camper and Nicholsons Italian build line of traditional lobster cruisers and yachts is surely looking to customers with an admiration to the past. For those who do not know Shamrock was Sir Thomas Lipton Americas cup challenge for a few decades 1899 till 1930, with five different Shamrock's being build and competing in the Worlds oldest sports challenge. The Camper and Nicholsons 60 Shamrock presents itself as a three cabin traditional yacht with sport lines but yet still classic. The main deck is a split level area and features a galley and two dinettes. The aft deck features two L-shaped settee's looking to aft. 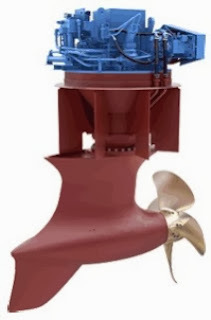 Standard power is twin 1000hp Cat engines with estimated top speeds of 33 knots. Mares International is pleased to announce the all new 45 Catamaran. Mares is now working with a new factory and re-tooled their line with newly styled pleasure cats ranging from 38 to 100 Feet aimed at the world market, the 45 first of the new Yacht line is the first in such models. Building power catamarans since 1985: Mares has incorporated the latest technology to their patented asymmetrical hull design including: Pod Drives and foil assist in the tunnel. The Mares hull forces air into the tunnel giving lift and ride on top of the waves instead of trying to push through them, which basically translates to the boat going faster and burning less fuel. The 45 Catamaran Flybridge features a European looking inspired super structure a stylish yacht that really does offer a fuel efficient alternative to the average craft. The core concept of the design is stability and fuel efficiency with everything you will find in a mono hull yet it offers all the advantages of a cat. 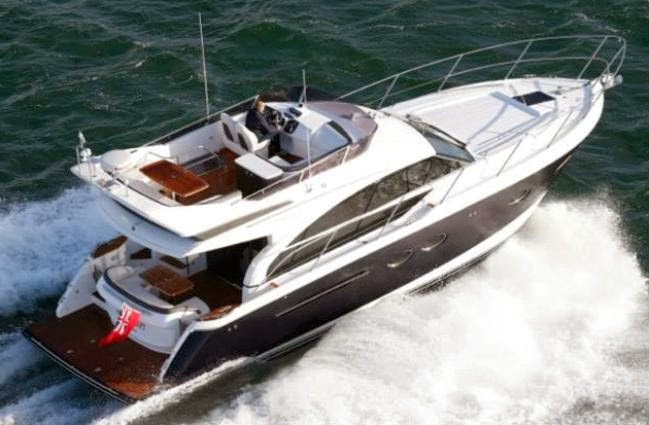 The 45 has a layout with two large staterooms, each equipped with a spacious head and shower. The master is appointed with a tremendous amount of room. The salon has a spacious design with full visibility, which includes an inside helm station, galley and comfortable seating with a high low table for dining. You can choose the 45 with a fly-bridge as hull one or as express style design. After a well received introduction to the first Monte Carlo 5 the past Dusseldorf boat show, the Beneteau Group was fast to capitalize on this success by extending the MC range with three further upcoming projects, one of which the entry level 4 model presented in Cannes. The Monte Carlo MC5S, builds on an identical platform of the standard 5 model with it being a glazed sunroof opening hard top sport yacht, that means no flybridge up top and second helm. 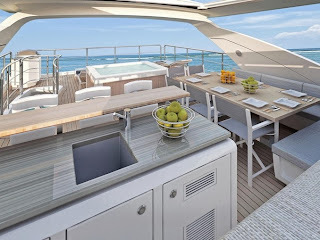 But the designers at Beneteau also felt the need to add something on top of the extended fiberglass part of the hard top and the MC5S features a C-shaped dinette up top which converts to a two person private sun-pad. Inside the the MC5S features the very well laid layout with its prime features being the astern galley, three double cabins, full beam amidships owners suite, and a crew cabin to aft. Power is twin Volvo 435hp engines with IPS pod drives. After the good receiving of the C34, Carver engages the market fast with a similar looking six feet larger sister. As the smaller C34 the new C40 follows the very good looks of its sibling, with a high free-board making the flybridge looking very low profile. The new Carver C series looks seem to be an optimal mix of European and classic US style elements. Distinct looking features of both the C models is the sweeping sheer-line and the very full near to vertical bow. The C40 will feature an accommodation with four berths in two cabins, with an owners room to fore and two shower heads. An extra double berth is to be available in the saloon from the convertible dinette. The galley is located on the main deck to port side. As is standard for American builders an option will exist for the main deck to feature an optional lower helm. When this is chosen a little of space will be taken from the C-shaped settee. 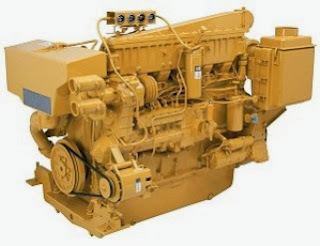 Standard power is twin Cummins 305hp or optional 380hp units, with traditional line shaft propulsion.